With over 70 years of skin in the game, ICOM has established itself as the go-to brand for those looking for top performing VHF marine radios. Although ICOM is an American company, it traces its roots back in Japan where it was founded by Tokuzo Inoue who was a renowned radio engineer at the time. ICOM has a long-standing history of creating compact state of the art radio equipment that has been useful in the radio industry for quite some time. Over the years, the company has been one of the largest producers of advanced gear in the western hemisphere including the Pacific as well as the U.S territories. We had to pick the ICOM M330G as one of ICOMs best-fixed mount marine radios to demonstrate how ICOM is the go-to brand for boat owners looking to improve safety. Simply put, the ICOM M330G is a must have for anyone seeking an adventure at sea, ocean or lake. It is packed with a 25 W transmitter, with 70 channels not to mention an IPX7 waterproof rating for durability. Undeniably, one of the best ways to improve safety while boating is to install a fixed mount VHF radio. Not only are they reliable for communicating with the coast guard and other boaters, but these simple devices can also get you out of a tough situation in no time. With the ICOM M330G, you get a compact fixed mount VHF radio from a reliable manufacturer and a variety of features that guarantee top performance. To begin with, the ICOM M330G comes with a flush mount kit, a microphone and an AIS receiver that is easy to install. The menu soft key operations on the ICOM M330G are also easy to navigate. The large backlit dot matrix LCD display adds up to the intuitive design of this marine VHF radio. When it comes to installation, the manual is pretty straightforward and you also get a GPS external puck antenna that delivers improved accuracy and signaling range. With a 25W power output, the ICOM M330G can transmit from a range of 5 to 25 miles if you couple it up with a powerful antenna. The GPS receiver delivers accurate performance thanks to the small and compact GPS puck antenna. It uses information from your GPS with the DSC (digital selective calling) for even more accurate functionality. Furthermore, it comes with a full function remote that allows you to access all the functions of the radio from the cockpit or flybridge. Don’t let the compact 6.2-by-2.6-by-4.3 inch size of this marine VHF radio fool you. 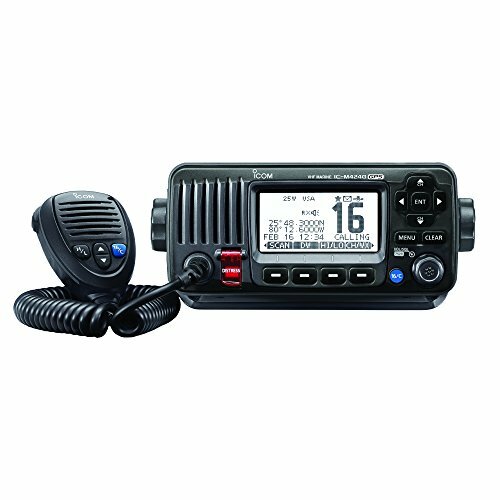 This is a fixed mount marine VHF radio that is easy to install yet packing all the right features that make it the best in class fixed mount marine radio. You can pick between the white and black color option for your boat. There is also an option to pick between one with or without GPS. With an IPX7 waterproof rating, you can expect the ICOM M330G to withstand some rough marine conditions. This VHF marine radio is designed to last many years even when being used everyday on the water. ICOM has a variety of VHF marine radios and the quality of the M330 can only be compared to that of the M424G and for a good reason. Even though the two devices share a variety of similarities including the waterproof rating, the output power capacity and the built-in GPA antenna, the M424 G comes with some notable improvements. First of all, it features a built-in noise cancellation feature that reduces background noise by up to 90 percent. This is a great feature for improving the quality of your voice for outgoing transmissions as well as for improving your incoming transmissions. Just like the M330, the M424G has an intuitive user interface with a rotary selector that gives you quick and easy access to all the functions on the device. The M424G, however, goes a bit further and adds a backlit LCD laser cut keypad for a more modern design. Granted the M330 does not give a lot of variety to choose from when it comes to color options for your boat. Even then, most boaters will agree that the two options available work just fine no matter the color and design of your boat. After all, a fixed mount marine VHF radio has more to offer in terms of functionality as opposed to its color and the ICOM M330 is certainly packed with enough features. The GPS antenna works well not just for transmissions, but also for communicating your exact location to other nearby boaters or the coast guard from far away. However, if you want a fixed mount VHF marine radio with an improved modern design, the M424G would be a solid choice. Yes, it is a bit expensive but it still falls closely within same price range as the M330.